Card Text: When Vodalian Merchant comes into play, draw a card, then discard a card. Flavor Text: Not choosing sides in a war can be dangerous—but lucrative. There are currently 1 Vodalian Merchant combos listed on our site. If you have your own Vodalian Merchant combo, we would greatly appreciate it if you would consider Adding Your Combo to our site. There are currently 14 Vodalian Merchant decks listed on our site. If you have your own deck that has Vodalian Merchant in it, we would greatly appreciate it if you would consider Adding Your Deck to our site. 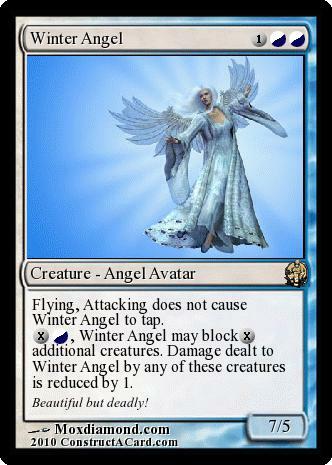 use the ohhhhh.... so great twilight's call and living death to put creatures into play. if you are playing some beefy green deck, then be sure to suprize them with the call as an instant. 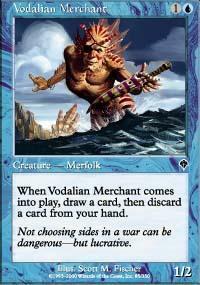 Vodalian Merchant was originally printed, and so far only exists in the Invasion magic the gathering set.